What is it about Islam that hates the West so much? 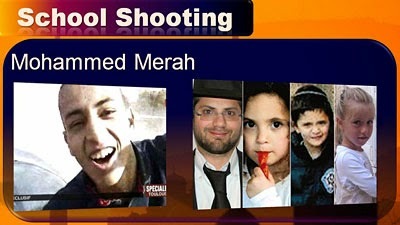 In March 19, 2012, in Toulouse, France, a 23 year old French Algerian by the name of Mohammed Merah pulled up in his motor scooter at the Jewish Ozar Hatorah Junior/Senior High School. He dismounted and then immediately began to open fire into the school yard. His barrage fell a 30 year old rabbi and teacher just outside the school gates as he tried to shield his two young sons, ages six and three, from the gunman. Merah shot one of the boys as he crawled away from his father and brother who were lying dying on the pavement. Merah next walked into the school yard, chasing people into the building. Once inside, he shot at staff, he shot at parents, and he shot at students. The killer then chased a little eight year old blond girl into the courtyard. He grabbed her by her hair. He put a gun to her head and he pulled the trigger. It jammed. Nothing happened. So, he threw the gun down, pulled out one of the many guns he was carrying, and he finished the job. Merah then hopped on his moped and drove off. Four people died in that shooting. It became the worse school-related attack in French history, and it became the biggest manhunt in French history. Merah, while he was doing all of this killing, filmed it with a camera he had strapped to his body. When he got home, he made a video of the killings, set it to music and verses in the Koran, and he uploaded it to Al Jazeera. Later that day, there was a long standoff with the police. Merah had a huge private arsenal and he wanted to go out as a martyr. He finally jumped out of his window yelling "Allah Akbar" and shooting at the police. The French authorities had to shoot him down. When the police researched Merah's background, they found that he had traveled to Afghanistan and Pakistan where he had been trained by Al-Qaida. In the video message that he left behind he justified his murders by saying, "These acts are not only necessary, but they were to uphold the honor of Islam." On November 5, 2009, US Army Major and psychiatrist Nidal Malik Hasan entered his base in Fort Hood, Texas. He took a seat at an empty table. He bowed his head for several seconds in prayer, then he stood up and shouted "Allah Akbar" meaning "Allah is great." Hasan fired into the unarmed crowed of his own fellow soldiers. Within 10 minutes he had killed 13 people and wounded 29 others. A total of 214 rounds had been fired, and he was still carrying another 177 rounds when a civilian police officer shot him and paralyzed him. Hasan was a Palestinian Muslim. He had attended the Falls Church Virginia mosque where two of the 911 hijackers had attended. He had ties to Yemen-based cleric Anwar al-Awlaki, who after the shooting posted on the internet that Hasan was a hero "for fighting against the US Army is an Islamic duty." Major Hasan has since been in the news and in 2012 was convicted on all accounts. On September 11, 2001, 19 Al-Qaida hijacked four passenger jets, slamming two into the World Trade Tower, one into the Pentagon, and one crashed in a field in Pennsylvania. Nearly 3,000 people died in the attack, including 227 civilians and all 19 hijackers who had committed suicide on those four planes. 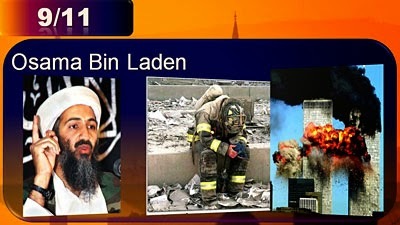 The mastermind behind 9/11 was Osama Bin Laden who said this about his extraordinary attack, "To kill American and their allies, civilians and military, is an individual duty for every Muslim who can do it in any country in which it is possible." What is it about Islam that hates us so much? Why are they trying to kill us? What turns normal people into raving murderers who say it's their duty to kill? Those questions are what will be covered in this series on Islam. To achieve this we need to get into the head of the Muslim. They are not just crazy people as many Westerners think. There's a reason behind their thinking. And, therefore there is a reason behind these killings and all these deaths. 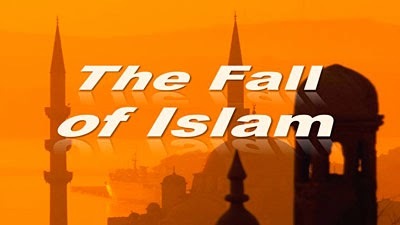 In the second segment of this study on the fall of Islam, we'll continue to seek an answer to this question by delving into the mind of the Muslim by getting to know some of Islam's background. First I would offer a pair of requisite definitions. Islam is an Arabic word which means the complete and total submission of an individual to the will of the Islamic "god" called "allah." A Muslim is the person who so adheres to this dictate. Muslims are born into the religion of Islam, or has been common throughout the past nearly 1,400 years, non-Muslims were forcibly converted to accept Islam. Refusals to convert have always meant death for that individual. Muslims have never been "normal people" by any non-Islamic standard. Muslims must adhere to the dictates of Islam as defined by the Qur'an and/or the Ahadith (plural for the many sayings or teachings of or attributed to Muhammed by his talib or students). In this, a Muslim is a true adherent of the dictates of Islam; otherwise he/she is an apostate from Islam and is subject to death. Movin' on to the next installment! I got to this page from a "Discuss Article" link on your email "How Do You Share Jesus With A Muslim?" "Koran, Sura 5:50 and 68 says that Mohammad gave an okay thumbs up for the Muslim to read the Bible." Wow, how powerful can that be! An open door to read the gospel of Jesus Christ! Unfortunately, when I looked up these two verses, 50 seemed to have no bearing, but 68 did indeed mention the gospel (depending on source) and seemed to fairly clearly uphold your claim. I expect you are not a scholar of the Koran, but quoting the source and offering some explanation would be helpful in a case like this. I expect 99%+ of your readers are ignorant of the Koran and wish to remain so other than tidbits like this that can help lead a Muslim to Christ. Agreed recommending Muslins read the Bible, especially New Testament, is great suggestion and this is recommended by other Gospel sharing ministries. I was disappointed by the statement, "she gave her life" because the gospel is salvation by grace through faith and not by works. God does the giving.The gospel should be presented clearly and accurately! Jim, thanks for having me double-check those suras concerning the Koran saying it's okay for a Muslim to read the Bible. 5:50 should be Sura 5:46-47, and one could add Sura 3:3. Sorry for the typo.